Cozumel is a beautiful island in the Mexican Caribbean, only 12 miles off the coast of the Yucatan Peninsula. One of the most popular destinations in the world for snorkeling and scuba diving, a Cozumel vacation package is a delightful way to enjoy the warmth and flavor of Mexico in a safe, intimate environment. Many Cozumel resorts offer world-class amenities and all offer exceptional opportunities to explore undersea wonders. The island is only 28 miles long and 10 miles wide, so getting around is easy and fun, and the lively port town of San Miguel offers visitors great alternatives for dining, clubbing and shopping. Despite growth and modernization over the years, Cozumel has managed to retain much of the local charm and warmth of its Mayan heritage. A Cozumel vacation package is the perfect choice for divers, water-sports enthusiasts and families looking for a more laid-back vacation experience. If you opt to fly into Cancun, round-trip transfers are provided from the Cancun International Airport to the pier in Playa del Carmen where you will ferry over to San Miguel on Cozumel. The transfer from the Cancun airport to the ferry pier usually takes 45 minutes to an hour. The 35-minute ferry ride is aboard a large, multi-level passenger ferry with comfortable air-conditioned inside seating. Outside upper-deck seating is available if preferred. The ferry operates frequent, regularly scheduled departures throughout the day. 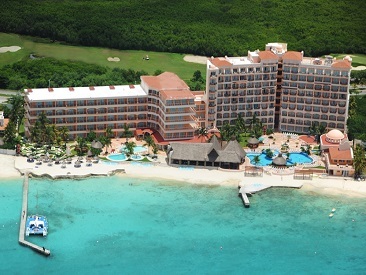 On the Cozumel side, you will be met at the pier and transferred to your hotel. Total in-transit time varies, depending on traffic from Cancun to Playa del Carmen, your arrival time in Playa del Carmen and the ferry schedule. Please Note: Some municipalities in the state of Quintana Roo have instituted an environmental tax/City Tax that will be charged to the traveler at hotel check-in. These taxes are generally only around $1 - $1.50 USD per room per night and do not apply to all hotels. If you are being charged this fee it is your responsibility to pay for this since it is not part of your prepaid vacation package. 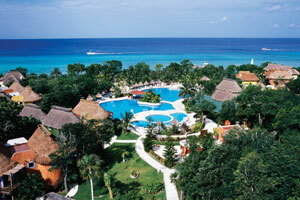 The Grand Park Royal Cozumel Luxury Resort is an oasis in the Caribbean sun and the island's leading All Inclusive. With unending accommodations and comfort, this hotel sets the bar high. Two stunning towers house 344 rooms, and each boasts a private balcony with excellent views of the Caribbean or the garden. 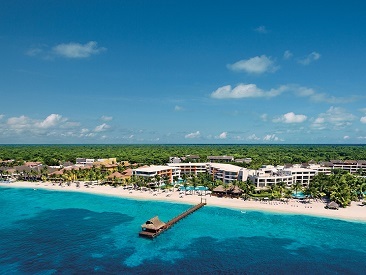 Meliá Cozumel provides a casual beachfront experience on Cozumel’s beautiful Playa Santa Pilar. Guests here can enjoy classic luxurious comfort in their comfortable suites, or enjoy the best in luxury in Meliá Cozumel’s The Level, where guests can also enjoy beach concierge service, reservation preference at the resort’s a la carte restaurants, private check-in/check-out service and more. 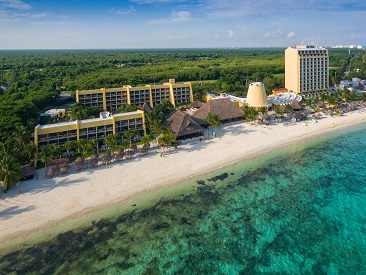 Located on the south side of Cozumel with an expansive white sand beach, the Sabor Cozumel Resort and Spa is a cozy yet active all-inclusive beachfront hotel ideal for couples, honeymooners, groups, divers and golfers. The resort has also introduced a family section located in the main section of the resort. Allegro Cozumel boasts comfortable rooms with a subtle tropical decor and architectural design inspired by tradition and perfect for relaxation. In addition, it offers a selection of 5 delectable restaurants, where guests can recover after a long, active day. 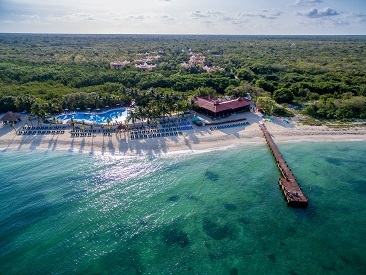 Occidental Cozumel provides a secluded tropical experience on Cozumel’s beautiful San Francisco Beach. Guests here can enjoy classic luxurious comfort in their spacious suites, or enjoy the best in luxury in Occidental Cozumel’s Royal Level, where guests can also enjoy an additional a la carte restaurant, exclusive amenities and other VIP services. 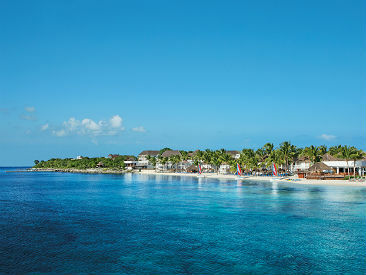 The all-inclusive El Cozumeleno Beach Resort is located on prestigious Santa Pilar Beach and is a favorite of divers. Located just minutes from downtown San Miguel, the hotel features an on-site dive shop and a mini-golf course. 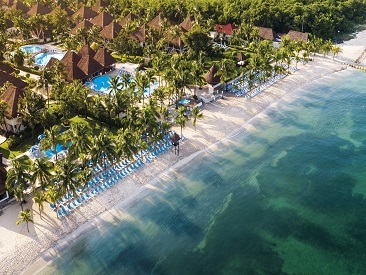 The all-inclusive Cozumel Palace, located on the edge of the great Palancar Reef, features a stunning bi-level infinity pool and waterfront beach terrace, and is within walking distance to trendy San Miguel with shops, bars, clubs and galleries. Enjoy valuable extras with Resort Credit promotions! 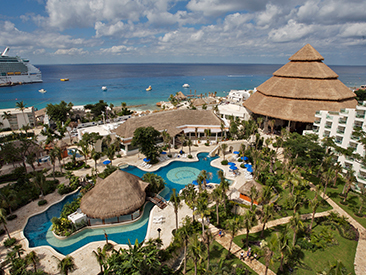 The all-suite adult couples only (18+) Secrets Aura Cozumel is more than a place to unwind. It is a unique boutique concept created to deliver a superior standard of service, accommodations, cuisine and entertainment to sophisticated guests.